Edit: The Snake Pit is no longer in business. The Snake Pit slithered into my consciousness last November as a work in progress. One month later, while strolling down Brunswick Street with Simon, I noticed that it was finally open for business. There was a menu clinging on to one of the windows, and I eagerly peered at it. Me: 5 dollar pastas! 10 dollar schnitzels! Can we try this place? Simon, with a shrug: Mmm... maybe. Now this response was interesting, because Simon is not usually one to turn down a good deal. I could see why he was hesitant, though. Let's face it, The Snake Pit looks pretty ugly from the outside. 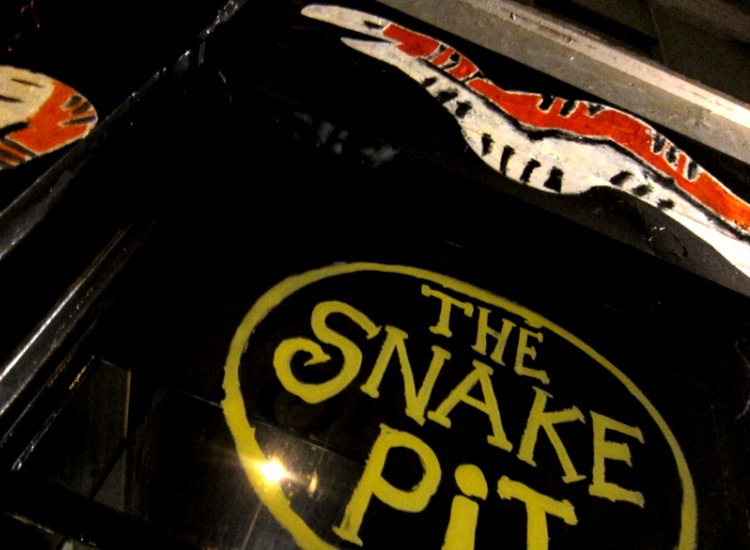 The questionable Snake Pit exterior. It does make you wonder. But I was willing to part with a measly five dollars for a taste of what The Snake Pit has got to offer, and last week, I finally convinced Simon to meet me there for dinner. Yes! A complimentary bowl of lightly spiced popcorn arrived cheerily at our table soon after we put in our orders and sat down. Free popcorn is never a bad thing, right? But let's move on to the main attraction. We both opted for the pastas from the 5-dollar section of the menu. This was Simon's spaghetti al pesto alla genovese. spaghetti al pesto alla genovese. This was my penne primavera. We liked the food! 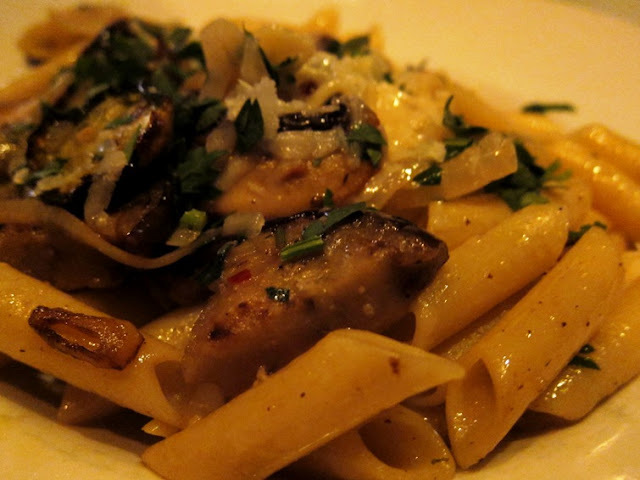 The ingredients were fresh and well-prepared; the pasta cooked to al dente perfection. The pesto genovese lacing the strands of spaghetti in Simon's dish was delicate and harmonious. The juicy mushrooms, eggplant and onion in my penne primavera engaged and gratified. And when I suggested that we return again sometime for another meal, I met no resistance. Ten dollar schnitzels, here we come! Update: Simon and I have returned for the $10 schnitzels, and while the servings were generous and the quality was not bad for the price, neither of us were as impressed as we were with the pasta the first time around. 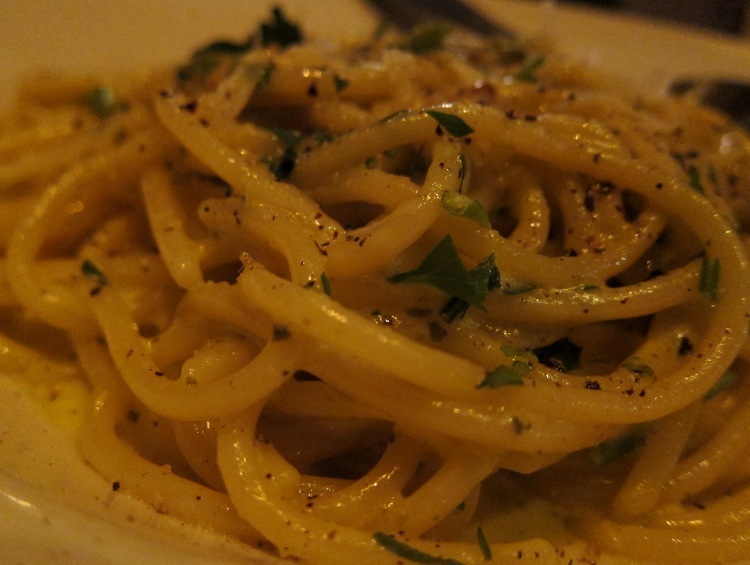 The two pastas mentioned above have also gone up to $8, though there are still a few $5 pasta options available. Moreover, we were told that they have a new chef - though whether this is in addition to or in replacement of the old one, I don't know. In light of these new developments, and acknowledging that this is a new business that is still finding its feet, I think I may need a few more dinners to make up my mind properly about the Snake Pit! Hard to find places that cook pastas al dente.. it's always over.. so yayy for you! I must admit I'm not the biggest fan of pasta, but this place does look interesting! $5 pasta?? What a find!